This detailed reference map combines two maps in one—a regional map of New York that includes all five boroughs and northeastern New Jersey plus a street-level map of Midtown and Lower Manhattan. The regional map—including all of Manhattan, Brooklyn, Queens, Bronx, and Staten Island—shows the area’s cities and towns, highways and roads, and a variety of points of interest. The inset map of Midtown and Lower Manhattan shows highways, streets, parks, landmarks, and other points of interest. The Financial District, Little Italy, Greenwich Village, the Theater District and the areas around the southern half of Central Park are among the neighborhoods shown on this map. 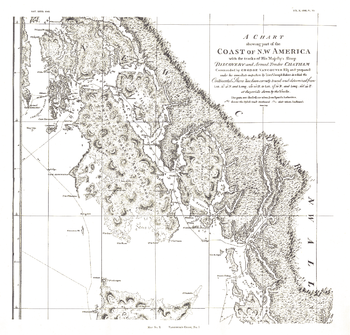 A Chart Showing Part of the Coast of NW America (Vancouver's Chart, No. 1) shows half of a chart of the coast of the Alaskan Panhandle and British Columbia including the Prince of Wales Archipelago, New Cornwall, and the Duke of Clarence's Strait. An antique black and white map perfect for framing, this map was published in November 1899 as half of a two-map set with the article "The Alaskan Boundary." A Chart Showing Part of the Coast of NW America (Vancouver's Chart, No. 2) shows half of a chart of the coast of the Alaskan Panhandle and British Columbia including the Admiralty Island, Lynn Canal, and Prince Frederick's Sound. An antique black and white map perfect for framing, this map was published in November 1899 as half of a two-map set with the article "The Alaskan Boundary." The West Indies have become a popular destination for travelers who seek a little more than relaxation and fun in the sun. Yet beyond the sand, surf, and picturesque islands comes a faint echo of a bold and brutal history of colonization from the Spanish, British, Dutch, and French. Explore this beautiful and intriguing region with "A Traveler's Map of the West Indies." Published in March 2003, this map was originally printed as half of a two-piece set with a political map of the West Indies. This revealing pair of maps show the dramatic differences in Native-American and European populations along the eastern coast of North America in 1491 and 1650. Population graphics reveal changes in population from 1500 to 1800. Published in May 2007, this map represents half of a two-map set. Its companion map, "1607: When Cultures Collide," is also available.